Food Basics Flyer Crazy Sale 23 Sep 2018 available to check here online. Food Basics making huge discounts on foods and beverages. Hurry up and make big savings on your shopping today. Are you bored of same dinner table? Ok than you can change your menus today. 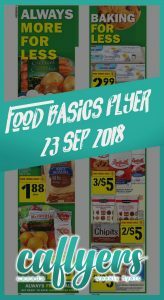 Food Basics Flyer Crazy Sale 23 Sep 2018 contains all good foods for good prices this week. One of the amazing one is maple leaf smoked boneless half ham. For only this week this product discounted to $5.97. Click and get more information about it. Food Basics Flyer Crazy Sale 23 Sep 2018 Saving time! Food Basics flyer contains always fresh, in stock and great prices. Summer deals are on now. Foodland Ontario harvest looks very delicious. Pick your favorite fruit or veg for the discounted price. Also, back to school deals are available here. Your kid’ supplies are discounted perfectly. Back to school deals will make your wallet happier! Check out all back to school deals of Food Basics flyer now.